Truly: how the hell does she do it? (Aside from shamelessness, that is.) A new video from Vox provides a framework for understanding her wily interview techniques. Vox isolates a couple of key techniques, chief among them her ability to glom onto a single keyword in the question and use that to pivot to an entirely new subject while still seeming to answer the question, a tactic compared here to “really bad improv.” This is what’s infuriating about her interviews: She takes straight questions and almost immediately leads you into a thicket of meaningless vagaries, and you’re never quite sure how you lost the path. Her more wince-inducing techniques come when that pivot fails, as interviewers stop being polite and she has to resort to passing the buck and straight-up lying. It’s propagandizing at its most opaque, a fundamental assertion that nothing is real, so why not trust the reality TV man. Of all the larger thinking surrounding the Trump administration’s relationship with the press, many have called for these massive news orgs to turn away from access journalism: to rely less on the White House press corps for information and to cut off airtime for these openly lying figureheads. 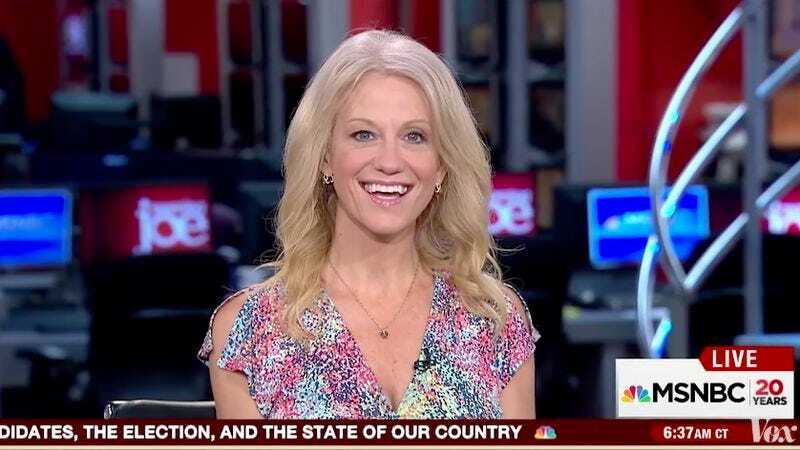 CNN reportedly recently declined at least one interview with Conway, setting a possible standard that others may or may not take. Such concerted effort toward objectivity would likely be characterized by Conway as fake news, which, coming from her, would be a compliment.